GOLD PRICES held little changed in a tight range in terms of all major currencies on Tuesday as Asian equities rose but European stock markets held flat ahead of the UK Parliament's "meaningful vote" on Prime Minister Theresa May's Brexit deal. With the Withdrawal Agreement proposed by May and the European Union set for a heavy defeat in the House of Commons this evening, betting at UK sportsbook Betfair now says an extension of Article 50 beyond the 29 March deadline for Britain's exit from the EU is overwhelmingly likely, pricing it at 1/5. 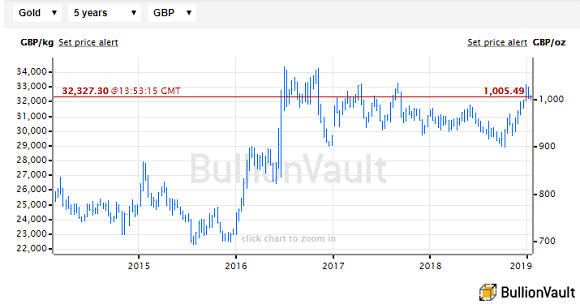 "British investors [should] bear in mind that if and when Brexit is behind us, we are likely to see a sharp rally in the Pound against the Dollar, and therefore also against the gold price," says ex-HSBC fund manager Charlie Morris. "That, of course, could take a while, and in the meantime I expect gold's bull market to continue. But it's just a headwind to be aware of." Looking ahead to a Corbyn government, "To avoid economic blackmail by the markets, any socialist government would need to impose limits on the movement of money by investors," says a column in left-leaning UK political magazine The New Statesman. The Goverment of Turkey – now offering to set up a 'safe zone' in northern Syria in its row with the US over Kurdish separatists – will meantime welcome Venezuela's industry minister at a gold refinery near Ankara on Wednesday as the Latin American nation, blocked by US and European sanctions, continues to raise funds by exporting gold to the Middle East. "We went off and we ordered American fast food, paid for by me. Lots of hamburgers, lots of pizza," said US President Trump last night after hosting 2019 winning college football team Clemson at the White House, where many staff are currently furloughed by the ongoing government shutdown. The longest shutdown in US government history, and still blocked by the impasse between Trump and Democrat politicians over funding his Mexico wall election promise, it's now costing the world's largest economy 0.1 percentage points of economic growth per week, an un-named White House official told media overnight. Missing analyst profit forecasts and reporting J.P.Morgan's worst bond-trading results since the Lehmans' crash of 2008, the investment bank's CEO Jamie Dimon said today that US GDP growth could slow to zero if the shutdown continues. Italy's government meantime met heavy investor demand for new bonds, raising loans at much lower borrowing costs than during late 2018 after Rome reached an agreement with Brussels over its 2019 budget deficit plans.